HOLLYWOOD—Oscar winner and one-time Academy Awards show co-host Anne Hathaway reveals that she will be watching the ceremony from the comfort of her home this year—and that’s just fine with her. Still, the 32-year-old actress says she is ready and willing to be there for her nominated friends and colleagues in the industry to lend an ear or provide a refuge from the insanity of Hollywood’s “awards season” should they need it. Hathaway, who earned an Oscar in 2013 for her supporting performance as the unfortunate Fantine in the big screen adaptation of the Broadway musical “Les Miserables,” knows it can be a crazy, happy and anxious time for nominees. 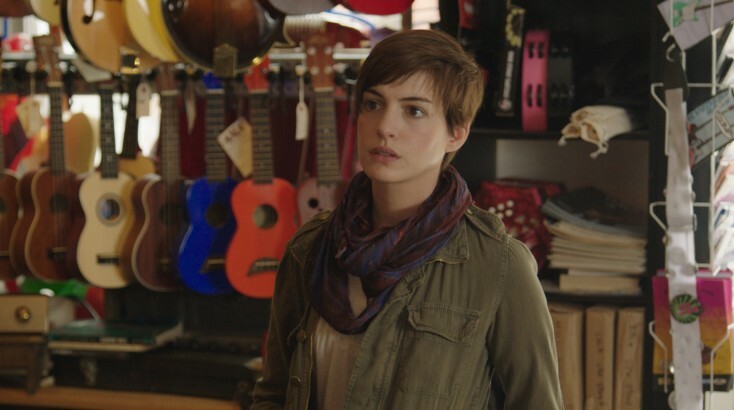 With “Song One,” a low-budget independent in which she stars, Hathaway tests out her producing skills alongside her husband of two years, actor Adam Shulman. She plays an anthropology grad student who is called home to New York from her exotic travels abroad when her younger brother is severely injured in a traffic accident. The drama opens in theaters and on-demand Friday, Jan. 23. Estranged from her family, Hathaway’s Franny must cope with the guilt of having left her sibling months earlier on bad terms. As Henry (Ben Rosenfield) lies in a coma at the hospital, Franny begins to retrace his steps, visiting clubs and bars where he played as a musician or patronized as a customer, using his journal as her guide. Surprisingly, Hathaway sings only one song in the music-filled drama, and because her character is not a professional vocalist, she sings it rather simply as a non-professional singer would. The actress explains that she has been contemplating producing for some time, and “Song One,” directed and written by first-time filmmaker Kate Barker-Froyland, proved a perfect vehicle to test herself. Q: You won an Oscar singing in “Les Miserables.” Here, you have to sing as a nonprofessional would. Did you put your ego aside to sing like a normal girl? Hathaway: I had to respect the truth and the limitations of my character. Q: What made you want to be in another music-filled film? Hathaway: When my husband and I came onboard, we were just going to be producers on this film. I hadn’t even shot “Les Mis” yet. I had only been cast in it yet, so I don’t think there was the awareness that I was in two musical projects or anything. Q: What touched you about this story that you wanted to be involved with this film as a producer? Hathaway: The universe appealed to me. When I say universe, I might only be speaking to the specific portion of the universe, but for me, the movie captures something that sounds so icky and New Age-y to say out loud, which is the healing power of music. That’s something I’m very interested in and believe in. It’s really cheesy to state, so it’s much better to explore it in a film. I really loved that. Q: What else appealed to you? Hathaway: I love stories about second chances. I love characters that make mistakes and grow from them, and (my character) Franny makes a really big one. Within the first five minutes of knowing her, you see her realize that she was absolutely, 100 percent wrong, and spends the rest of the movie trying to make amends for that. I really liked that. When I read the script for the first time, there was this huge question mark over the whole thing, which was “What is this music going to be, and who on Earth is going to be able to sing it and to act it?” My husband, and Kate, and Thomas her husband, spent the next few years trying to answer those questions. Q: When Johnny’s character is approached by female fans when you’re on a date at the restaurant, is that something you can relate to? Hathaway: Yeah, the difference between my life and this scene is that, in my life, I have been both the person crying and the person who the fan approaches. In this one, Franny became kind of invisible. I’ve had experiences where I’ve been having tearful conversations and somebody comes up and asks if I’ll take a selfie with them. It’s just kind of the world we live in. No one means anything by it. It’s actually flattering, if you really think about it. People just want to reach out. That’s just a particular side of my life. Q: Could you talk about taking a chance and doing this low-budget movie? It’s typically so hard to sell independent movies, no matter what. Hathaway: This film is a hard one to sell, and it felt like, in some ways, one of the riskiest ones I’ve ever made, because I’m putting my name out there as a producer. I’m saying, “I believe this film should exist, and it has merit that you should check out.” It’s a quiet film, and we live in a decidedly unquiet time. We live in a time that rewards noise. This is not that film. This film is sincere; this is a time that values snark. This film speaks from the heart. If you’ve ever tried to do that, publicly, you know what that feels like. In a lot of ways, this film feels like a really, really big risk. But I have to believe that there are people out there who feel under-served by movies and are looking for a simple, quiet story, about people going through a tough time, and that has a quiet optimism that life can get better, and we can heal. I’m just really hoping that people come at it with a sense of openness. I guarantee you if you believe in music, this film will speak to you. Q: How long have you been thinking about being a producer? What have you discovered now that you’ve done it? Hathaway: In the past few years, I started to look at material to produce. This particular project came to me and my husband, because (producer) Jonathan Demme had worked on the script for two years with Kate (Barker-Froyland), and thought that Adam and I would be a good fit to produce it. 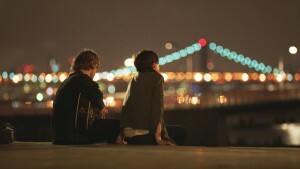 (l-r) Johnny Flynn and Anne Hathaway stars in SONG ONE. ©Cinedigm. Q: How do you feel about it now? Hathaway: I like producing. That was one of the big surprises. I have a better sense of what kind of producer I am. I like to go out and find content and match it with the right filmmaker or screenwriter, and get that going. Q: Do you still wear your producer hat when you’re acting in the film? Hathaway: No. Once it becomes time to actually do the day-to-day production, I like to be an actor. I don’t like to wear both hats. I don’t like to split my focus. Luckily, on this movie, I was working with a team of producers. They afforded me the freedom to just focus on the acting. Another thing I learned as a producer is that stuff doesn’t just magically happen on a film set, the way I thought it did when I was an actor.